The CUPP went further to provide examples to prove that President Buhari is not truly fit to carry on with the office and functions of a president. “A few recent examples will be necessary here. One, you will recall how the President almost fall flat on his face during his recent campaign visit to Lokoja, Kogi State. Despite that he flew into the town, the few steps the President took at the rally venue had a huge toll on him. When he was invited to the podium, he lost balance immediately he stood up. It was the timely intervention of his aides who were already keeping their eyes on him since they know his health status, that saved us what would have resulted into a national disaster. A few days after the Kogi episode, a similar scenario played out at the venue of his campaign rally in Kaduna. After he trekked a short distance to his seat, President Buhari was clearly exhausted. He was still managing to wave to those who were already at the venue when he suddenly sunk heavily into his seat even at a time the national anthem was being recited. The seat was his saving grace on that occasion. After those who surrounded him corrected him, President Buhari again referred to Ogboru as “the senatorial candidate.” Again, he was corrected and he came up with the most embarrassing one by saying the man is the “governortorial” candidate. The President must be using a different dictionary because the word “governortorial” does not exist in any good dictionary. 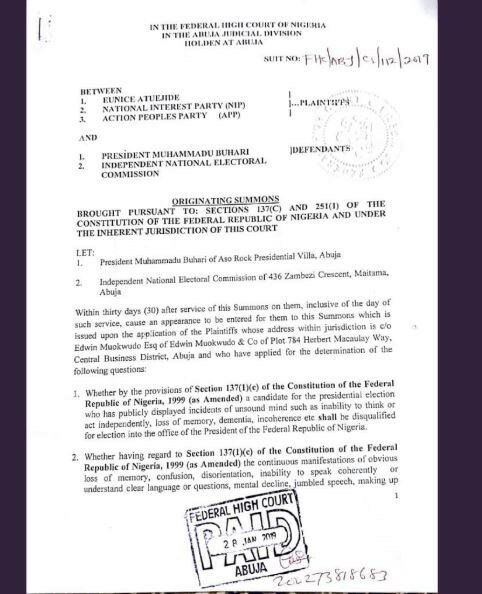 We are also seeking from the Court an Order disqualifying President Muhammadu Buhari from contesting the election to the office President of the Federal Republic of Nigeria, and an injunction restraining INEC from recognizing his candidacy. Nigerians will also be glad to know that to prove that we are on the right path, we are also asking the court to grant an order directing President Buhari to make public the results of the medical examination which we ask that he be subjected to so that no citizen will be in doubt that we are saving the country from calamity by taking these steps.